2010 Color Trends: Charcoal is the new black. Color for 2010 is sophisticated, organic, and contemporary yet comforting. According to World Global Style Network, the tinted, shadowy colors inspire a romantic mood with overtones of drama. Dense darks create mystery and a desire for hibernation. Dark charcoal replaces true black. Grays are tinted with blue, green and mauve for a new take on neutrals. Greens turn more gray and to oceanic blue-greens. You will also see brighter spearmint greens. Intense indigo-ink blue and gray-tinted blues are important. 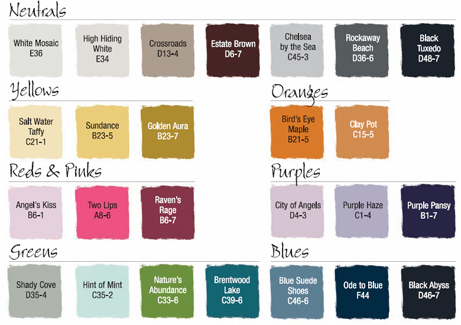 Rich purples are tinted with gray or brighter blue. Dark mauves have an almost brown cast and pale tones are washed out or metallic-inspired. True yellow is replaced with nature-inspired tones of corn and wheat. Browns and oranges are organic and earth-based. Color-washed pales are pretty and clean with a hint of nostalgia. Super-bright red with an orange cast is important, as are raspberry and watermelon. Highlights of neon pink and bright lime are used across many palettes to add a modern aesthetic. Another important trend is using bright colors on accent pieces like chairs and side tables. Stay tuned for our painting DIY video with Kendra at Tenleytown Ace Hardware.